Senator Edgardo J. Angara – an educator, lawyer, banker, farmer, patron of the arts – is the longest serving senator in the post-EDSA Senate. Except for a mandatory term break, he has been elected to four consecutive terms of six years each. Throughout his long and storied career as a legislator, Angara advocated for legislation that made a direct impact on the lives of millions of Filipinos. He authored landmark laws on agriculture, education, health, arts and culture, science and technology, good governance, financial reforms and social welfare. He started his political career when he was elected in Quezon province as one of the youngest delegates to the 1971 Constitutional Convention. A year later, he founded together with an enterprising group of law classmates what would become one of the country's top law firms, the ACCRA Law Offices. In 1975, Angara became president of the Philippine Bar Association, the oldest voluntary bar society in the country, and in 1979 president of the Integrated Bar of the Philippines (IBP), the unified association of lawyers, demonstrating his emergence as one of the most prominent leaders of the Bar. His leadership was recognized even in the international arena. In 1980, he was chosen as founding president of the Association of Southeast Asian Nations (ASEAN) Law Association, one of the largest regional law associations in the world. From 1981 to 1987, Angara served as president of the national University of the Philippines (UP). Through his initiative, the general education program was strengthened, a seven-year honors medical curriculum installed, the arts and basic science energized, and a multi-campus university organization was put in place. He is best remembered for defending the state university's tradition of dissent, and obtaining fiscal autonomy. His efforts contributed to upholding its reputation for academic excellence as the country's premiere educational center. Angara rallied alumni in the country and abroad in a massive fundraising drive both for UP’s diamond jubilee in 1983 and centenary in 2008, when he chaired the UP Centennial Commission. Substantial funds raised went into faculty development, scholarships, student assistance program, and massive infrastructure development. The UP Board of Regents established in his honor the UP President Edgardo J. Angara Fellowship, the largest single grant available to UP professors. During the 8th Congress (1987-1992), he headed the Congressional Commission on Education (EDCOM) that restructured and instituted wide-ranging reforms in the country’s educational system. His reputation as a resolute reformer enabled him as senator (1987-1998, 2001-present) to overcome the legislative gridlock that stood between the legislative and executive branches of government and successfully steer passage of groundbreaking legislation. In 1993, his peers elected him Senate President, the third highest political office of the land. His tenure as Senate President has been the most outstanding to date, according to the Social Weather Stations survey. Angara was able to push for the passage of some of the country's most memorable laws. These include the Free High School Act, Commission on Higher Education (CHED), Technical Education and Skill Development Authority (TESDA), the National Health Insurance Act (Philhealth), Senior Citizens Act, the Agriculture and Fisheries Modernization Act (AFMA), the Renewable Energy Act and the Procurement Reform Act. Angara has also shown deep commitment for the promotion of culture and the arts as the author and sponsor of the laws creating the National Museum, the National Commission on Culture and the Arts (NCCA) and the Natatanging Manlilikha Award which bestows honor on the Filipino folk and traditional artists. He also authored the National Book Publishing Industry Development Act and the National Cultural Heritage Law. 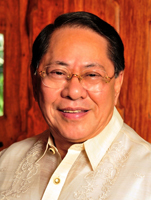 He served as chairman of the Philippine National Bank (1998-1999). His knowledge of the financial markets led to the passage of reform laws for the country’s capital markets. These include the Credit Information System Act, Personal Equity And Retirement Account (PERA), Real Estate Investment Trust (REIT), Philippine Deposit Insurance Corporation (PDIC) charter, Pag-Ibig Fund Charter, Pre-Need Code and Financial Rehabilitation and Insolvency Act (FRIA). As Secretary of Agriculture (1999-2001), Angara had the opportunity to implement his own creation, the AFMA. In 2001, he served as Executive Secretary of Joseph Estrada, during which he oversaw the peaceful transition of power after the second people power revolution. Currently, Angara is spearheading a comprehensive review of the country's S&T capacity to stem our declining global competitiveness through the Congressional Commission on Science, Technology, Engineering (COMSTE), which he chairs. His efforts to rekindle the Philippines' historic ties with Spain and Mexico has institutionalized the Philippine-Spanish Friendship Day Act and the Dia del Galeon. He has been awarded Spain’s Premio Casa Asia in 2010, making him the first Southeast Asian to win the foreign policy prize. He is the official representative of the Philippines to the Unión Latina, an organization consisting of 37 member-nations of the neo-latin languages. Angara has been a recipient of the Commandeur dans l'ordre des Palmes medal, a citation conferred by the French Republic to individuals engaged in promoting excellence in higher education. He was the first Lee Kuan Yew Fellow in the Philippines, an award the Singapore government confers on individuals who demonstrate outstanding public service. Angara's drive for good governance likewise enjoys international support. He is a member of the executive board of the Global Organization of Parliamentarians Against Corruption (GOPAC) and was elected its vice president during the group's 4th global conference in Mexico City in 2011. True to being a trailblazer, he led the formation of the South East Asian Parliamentarians Against Corruption (SEAPAC) and was elected its charter president in 2005. Because of his untiring commitment, GOPAC chose the Philippines as the host of its next biennial conference in 2013 which will bring together more than 500 members of parliament from 50 countries. He was one of the most vigorous supporters and contributors of the country’s first and only bilateral trade agreement, the Philippine-Japan Economic Partnership Agreement (PJEPA), which entered into force in 2008 and now serves as a foundation for the two countries’ sustained and increasingly dynamic economic engagement. For these and many more achievements, Senator Angara was feted the Cordon of the Rising Sun by the Emperor of Japan, the highest decoration awarded by the Japanese Imperial Household to a Filipino. He was appointed by President Rodrigo Duterte as the Philippines’ Special Envoy to the European Union and Chairman of the New Clark City, the country’s first smart city and emerging aeropolis in ASEAN. Angara's productive track record and systemic approach to reform is a clear proof that, despite formidable odds, genuine reforms can be accomplished in the country.